As a native Oregonian, I'm sometimes embarrassed to admit that I haven't been to every corner of the state and seen every single sight from multiple angles. Such was the case several years ago when we finally decided it was high time to visit southeastern Oregon's magnificent Steens Mountains, staying in a double-wide trailer at the astonishingly beautiful Malheur Wildlife Refuge and gazing over the spare, parched landscape of the Alvord desert. Sharing nature's wisdom. And sticks. Closer to home, while we've tramped over a lot of Mt. Hood's forested east and west sides, I've somehow never managed to explore the area above Estacada on the road to Bagby Hot Springs. 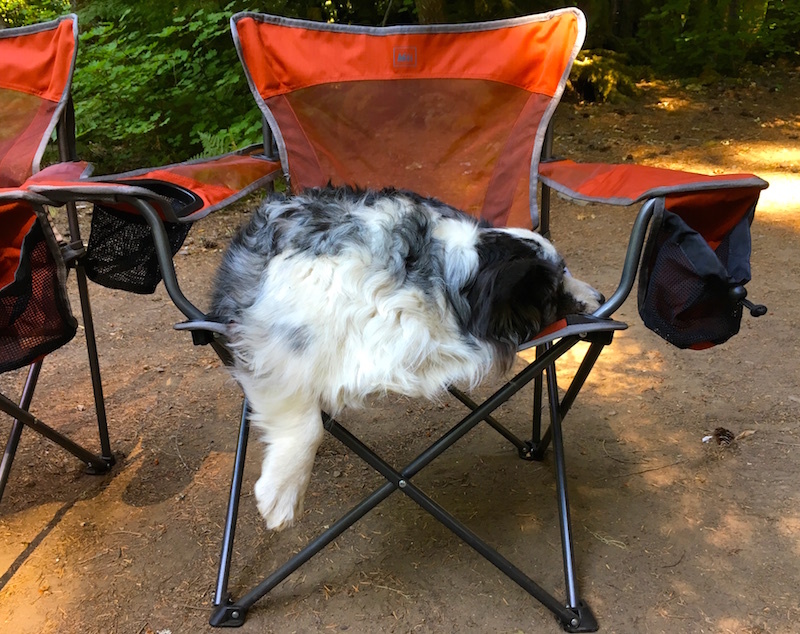 Fortunately a friend decided to organize camping trip to the area, and our group of five families was able to secure multiple reservations in the Kingfisher campground along the Collawash River. Relaxing is the name of the game. Small, with only 23 campsites, and fairly primitive—think narrow dirt track, unpaved sites, water from a pump, vault toilets and no electrical hookups—its basic nature scares away the big rigs with their generators and sound systems, but it was perfect for our veteran camping crew. Food was apportioned according to the talents and desires of each family, with dinners of hot dogs with trimmings the first night (Olympia Provisions and Old Salt Marketplace were featured), steaks the second night and, for those staying an additional night, it was "hobo packs" à la foil packets cooked in the fire (recipe here, perfectly adaptable for the home grill). Steak night with the grill-master. All the campsites are fairly private, well-spaced and screened from each other by trees, but the prime sites are those along the river, particularly sites 6, 8 and 10, which have nice shady stretches of river-front for setting up chairs and reading. 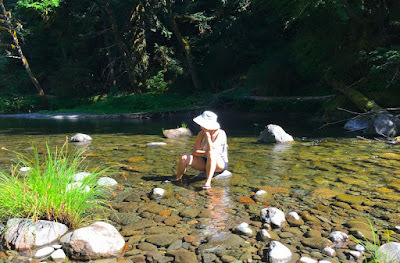 When we were there, the river itself was pretty tame, with lovely shallow, wade-able stretches perfect for skipping rocks or for finding a perch midstream and contemplating the nature of the universe. Who needs a stinkin' campstove? 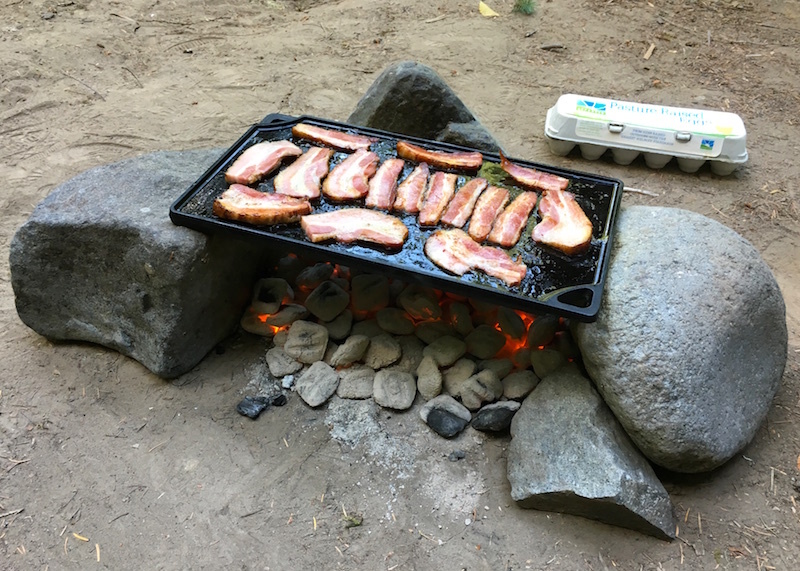 If you're looking for some nice gear to add to your collection, I'd highly recommend a cast iron griddle for cooking pancakes, bacon, eggs and sausages over the fire. Dave threw together an ad-hoc stove from river rocks that MacGyver would approve of, though we've used it on the fire grate numerous times. 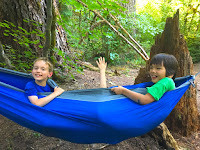 Another recent addition to our repertoire has been a nylon hammock. 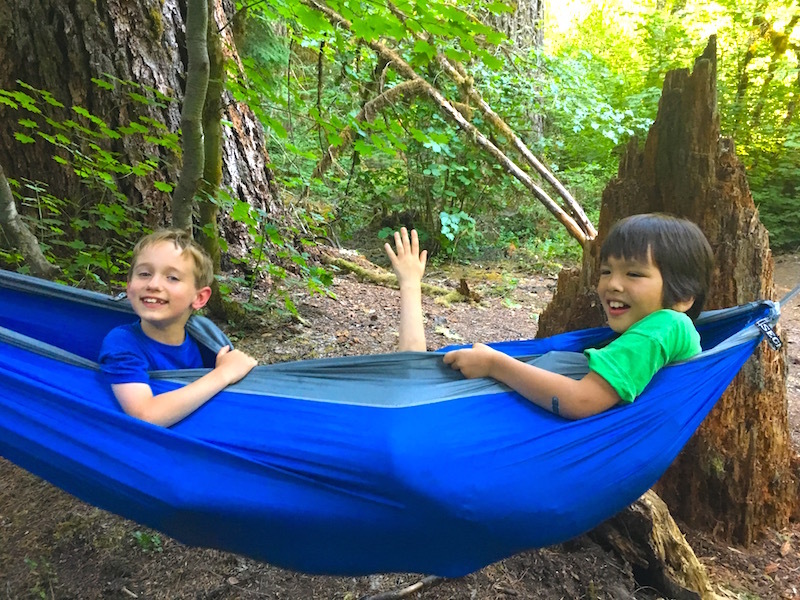 Simple to sling between a couple of trees and a must-have for a peaceful nap streamside, it's also sturdy enough for kids to play in (ours is rated for 500 pounds). Come to think of it, it might also be the perfect solution for teens who cringe at the thought of sleeping en famille. 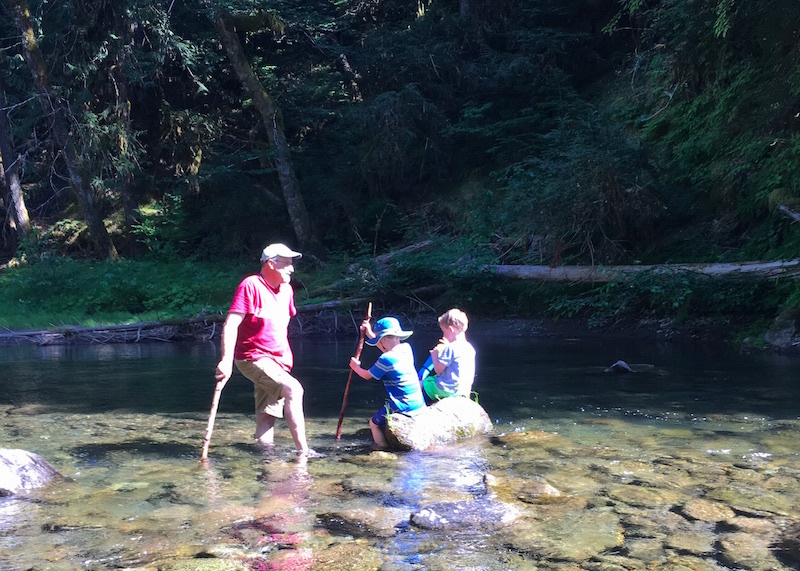 Clocking in at just under two hours from Portland, this idyllic campground is justifiably described as a diamond in the rough and got the thumbs-up from everyone in the group. We'll definitely be adding it to our list of great spots for a quick weekend camping trip. 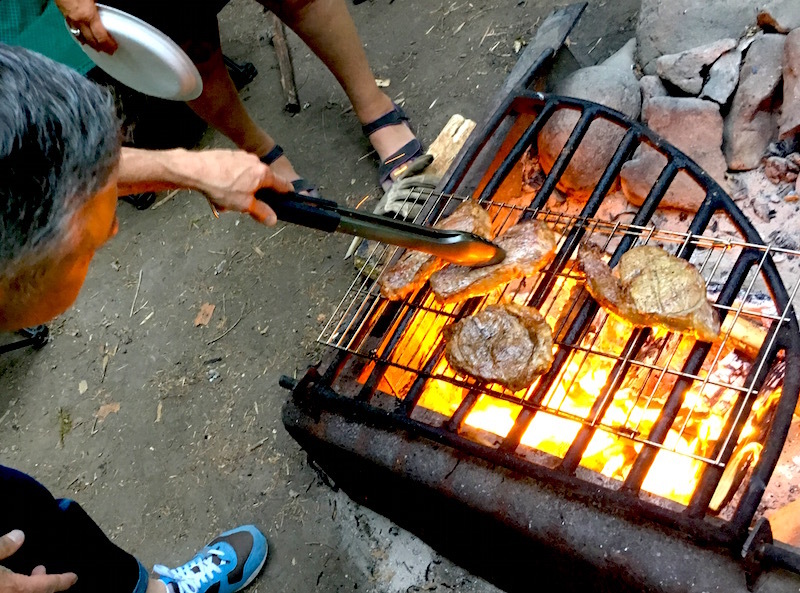 Read more Camp Stories including site recommendations, recipes and more! Hey! Don't tell everyone or we won't be able to get our bank of sites next year! 😄. Also, it's only 1.5 hours for those of starting out from the south end of PDX. Ah, good times.